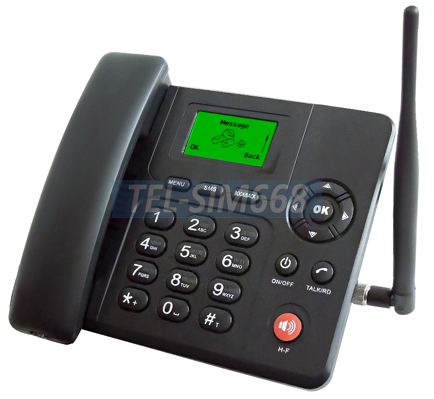 This fixed wireless 3G GSM desktop phone is a smart and cost effective way for your home or office. No landline service needed from local phone company. Save you monthly fee for home phone bill by using any pre-paid or unlocked SIM card for this telephone as the dialer to make and receive phone calls. This 3G phone has large keypad with 2.4" LCD TFT screen. Easy to use and can also help the elderly and people with disability to connect with family and loved ones. As it does not need to hook up with phone jack, it can be placed anywhere needed. 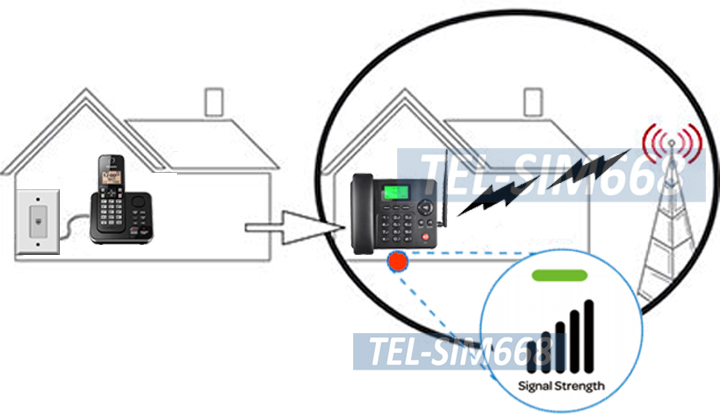 It is also very suitable for remote or rural areas that do not have landline while mobile phone network is available. This 3G wireless desktop phone works the same as a unlocked mobile phone allowing you to choose what SIM card deal you want. Users can also send and receive SMS messages through this phone and its keypad, just like what a mobile phone can do for you. This 3G desk phone works with any telecom carriers in the world that supports 3G WCDMA tri-band frequency or 2G GSM quad-band frequency. [Note]: This phone can only support T-Mobile and AT&T networks in USA. For users from other countries, please check for the carrier's system type and band frequency before purchase. Simply inserting your new or existing 3G SIM cards into this phone and plug the power adapter into the phone. That is all done. So it can work with any telecom carriers in the world that supports 3G WCDMA tri-band frequency or 2G GSM quad-band frequency. [Note]: This phone can only support T-Mobile and AT&T networks in USA. For users from other countries, please check for the carrier's system type and band frequency before purchase. No phone cord needed or attached. Users can place it anywhere in the house or office as needed. 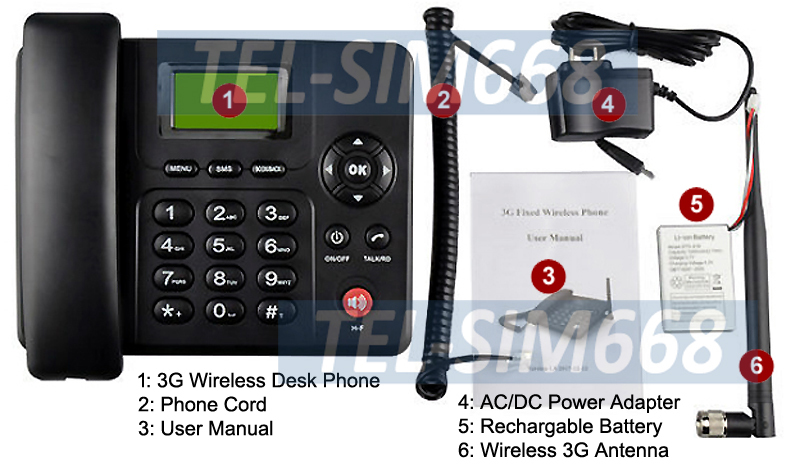 This 3G GSM desktop phone can be powered by 9V DC power adapter for indoor use or by its internal battery for mobile use. This phone has an rechargeable 1000mAh lithium battery built in for mobile use. One full charge of battery power can provide 6 hours of talk time or keep the phone ready in standby mode for up to 72 hours. It also has low battery LED indicator. When the battery LED is flashing, the battery is low in power. Large telephone buttons and easy to use like mobile phones for the elderly and people with disability to use with its super simple functionality. This 3G phone has speaker phone function built in. Users can pick up the incoming calls from using the handset or pushing the speaker phone button. Strong reception with high gain antenna included in the package. The antenna is detachable and swappable. This phone has large 2.4-inch LCD screen display with backlight. Easy to see the phone numbers, text messages and make calls. Users may use the keypad on the phone to write text messages before sending. Users can also receive text messages sent by others too and store the received texts in this phone. Different chord ringers for incoming call and SMS. 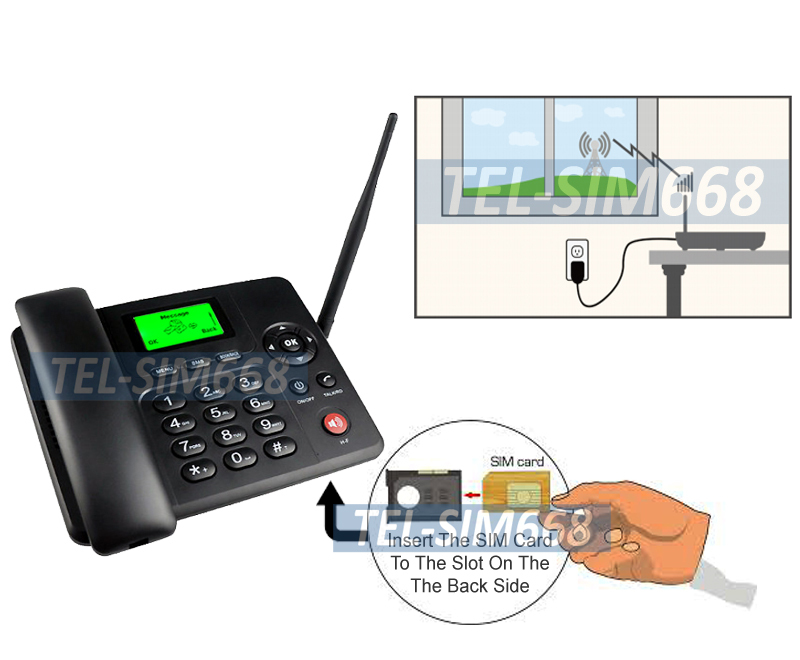 This 3G wireless phone can display the incoming or outgoing phone number on the phone LCD screen. Users can also set up voice mail with greeting message on this phone. This phone also has a FM tuner built in so users may use it as a radio and tune into desired local FM radio channels. 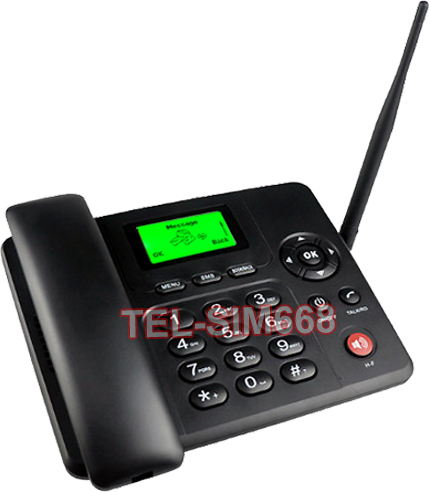 Other common features such as alarm clock, calendar and calculator function are also available from this desk phone. No need to subscribe to regular landline service with local phone company. Save you monthly fee for home phone bill. 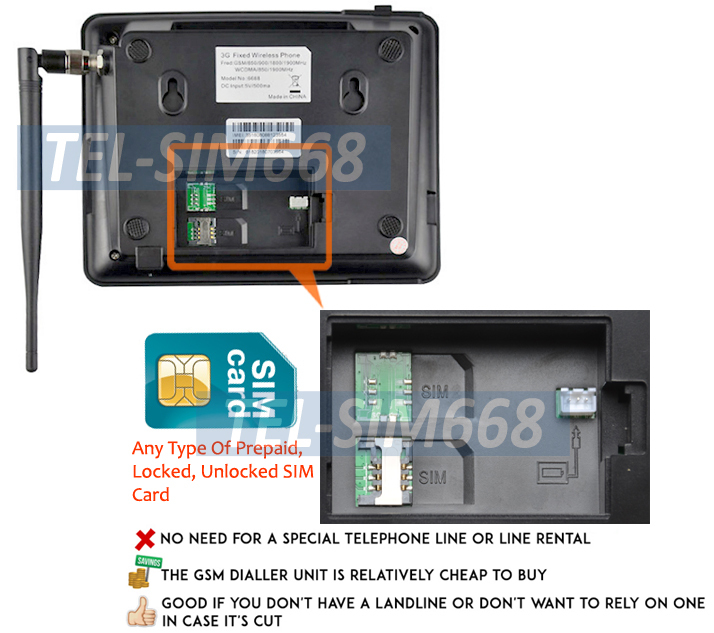 You can use any pre-paid or unlocked SIM card for this telephony module as the dialer to make and receive phone calls. No more worry about the thief to tamper with the landline from the outside phone box. Always ready to call out or receive calls 24 hours 7 days a week. A smart and cost effective 3G/GSM phone for your home or office. 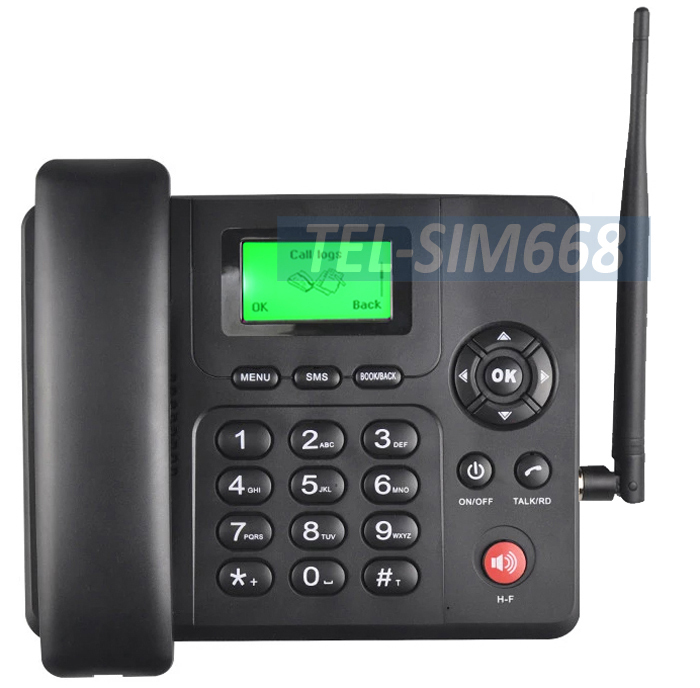 Using any pre-paid or unlocked SIM card for this telephone as the dialer to make and receive phone calls. No more worry about the thief to tamper with the landline. Always ready to call out or receive calls 24 hours 7 days a week. Simple navigation menu with speaker phone and microphone for hands free talking. Supports SIM cards from carriers that use 3G WCDMA band frequency from 850/900/1900/2100 MHz. Supports SIM cards from carriers that use 2G GSM band frequency from 850/900/1800/1900 MHz in the world. SMS functionally allows you to send and receive text messages. Users can use the keypad on the phone to write text messages before sending and also receive text messages sent by others. Store the received text messages in this phone. Pick up the incoming calls from using the handset or speaker phone and mic for hands-free talking. An easy way for elderly to keep in contact with their family as well as for families and businessmen to save on costs. 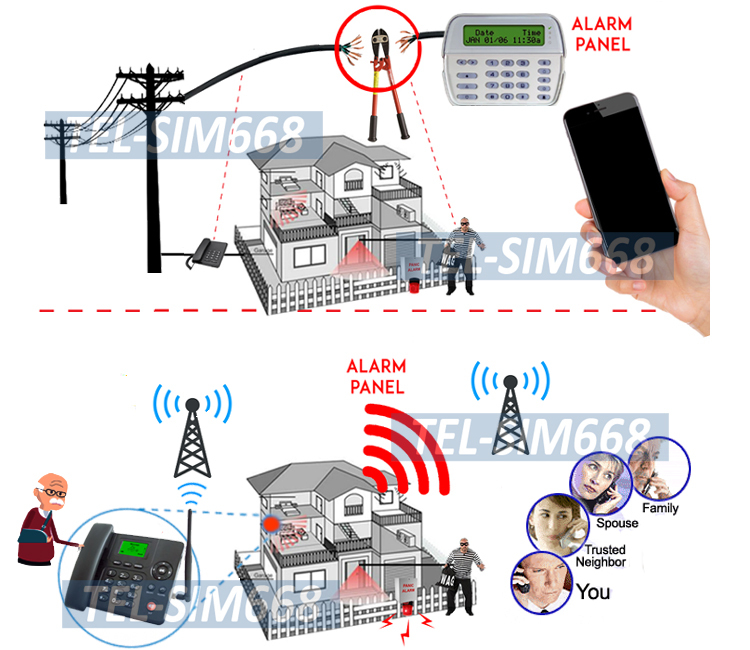 Very suitable for remote or rural areas that do not have landline while mobile phone network is available. Adjustable volume and ringer levels. Displays the incoming or outgoing phone number on the phone LCD display. Strong reception with high gain antenna included. The antenna is detachable and swappable. Internal lithium battery built in with low battery power LED indicator designed for mobile use. One full charge of battery power can provide 6 hours of talk time or keep the phone ready in standby mode for up to 72 hours. Double as FM radio through using its internal FM radio tuner function. Powered by 9V DC power adapter or internal battery, no worries about running out of power. Lock-Up Function: Keypad, SIM card, network.